What rights should all Americans enjoy? What rights would only some Americans possess? On what terms would the nation be reunited? What was the status of the former Confederate states? How would citizenship be defined? Were the former slaves American citizens? When and how would former Confederates regain their citizenship? What form of labor would replace slavery? they are often an obstacle to a deeper understanding of the period. Given these challenges, I have gradually settled on an approach to the period that avoids much of the complex chronology of the era and instead focuses on the “big questions” of Reconstruction. However important a command of the chronology of Reconstruction may be, it is equally important that students understand that Reconstruction was a period when American waged a sustained debate over who was an American, what rights should all Americans enjoy, and what rights would only some Americans possess. In short, Americans engaged in a strenuous debate about the nature of freedom and equality. With the surrender of Confederate armies and the capture of Jefferson Davis in the spring of 1865, pressing questions demanded immediate answers. On what terms would the nation be reunited? What was the status of the former Confederate states? How would citizenship be defined in the postwar nation? Were the former slaves American citizens now? When and how would former Confederates regain their American citizenship? What form of labor would replace slavery? White Americans did not expect blacks to participate in Reconstruction-era debates. Blacks thought otherwise. The nation’s approximately four million African Americans, of whom roughly 3.5 million had been enslaved, were at the center of each of these questions. If white northerners had only gradually come to understand that the Civil War was a war to end slavery, they recognized immediately during the postwar era that the place of blacks in American society was inextricably bound up in all these pressing questions of the day. Even so, white northerners, and more so white southerners, presumed that they would debate and resolve these questions with little or no consideration of black opinion. Nothing in the previous history of race relations in North America prepared white Americans for the conspicuous role that African Americans played in the events after the Civil War. By the end of Reconstruction, no Americans could doubt that African Americans were intent on claiming their rights as citizens or participating in the debate about their future. Black citizenship depended on the status of the Confederate states. That African Americans became American citizens was arguably the signal development during Reconstruction. Only a decade earlier the Supreme Court had ruled in the Dred Scott decision in 1858 that people of African descent imported into the United States and held as slaves, or their descendants—whether or not they were slaves—could never be citizens of the United States. When, during the Civil War, slaves began to flee to Union lines in growing numbers and after the Emancipation Proclamation, it became clear that “facts on the ground” would overtake the Dred Scott decision. However, any resolution of the status of former slaves had to be resolved within the context of American federalism, because until that time citizenship was defined and protected by state law. Therefore, the resolution of the citizenship status of blacks was contingent on the status of the former Confederate states and their relationship with the nation at large. After the Civil War, were the Confederate states conquered lands, frontier territories, or states in good standing? Who exercised the power to define the rights of former slaves would depend upon who held the power to dictate what happened in the former Confederacy. Were the former Confederate states conquered territory? If so, then the federal government (or, in other words, northern whites and Republicans) could dictate the reconstruction of the South. Or were the former Confederate states essentially quasi-frontier territories that had to be readmitted to the union? If so, then the voters of the South would decide the course of the former Confederacy. In addition, those same voters would decide the content of citizenship in their states. Or were the former Confederate states still states in good standing that would return to their former, pre-war status as soon as southerners elected congressmen, senators, governors? If that were the case, then presumably the southern states, and the definition of citizenship that prevailed in them before the Civil War, would be restored. Northern opinion on this question varied widely. Abraham Lincoln, before his murder, had recommended the speedy return of the southern states. Lincoln presumed that the reunion of the nation was of paramount importance. Andrew Johnson, who assumed the presidency after Lincoln’s assassination, adopted the same view of reunion, proposing to restore political rights to white southerners as soon as they pledged loyalty to the union. While willing to grant presidential pardons to even high-ranking Confederate officers and politicians, Johnson displayed no interest in extending citizenship to former slaves. Other northerners looked askance at Johnson’s decision to restore political power to white southerners, especially after their behavior suggested little contrition on their part. In the fall of 1865, white southerners who had regained their political rights under Johnson’s policies elected many former Confederates leaders and generals, including even the Vice President of the Confederacy, to represent their states in Congress. Northerners who had just fought against secession for four years and who had buried hundreds of thousands of wartime casualties refused to tolerate the seating of Confederates in Congress less than a year after the guns fell silent. The issue of African American citizenship provoked equally complex competing views. White southerners had clear ideas about the social and racial order that would replace slavery; they intended to restrict the rights of citizenship to whites as much as possible. During the fall of 1865 southern state legislatures that had been organized under Johnson’s Reconstruction plan adopted oppressive laws, known as the “Black Codes,” that narrowly defined the civil rights and social and economic status of the freed people. The Codes explicitly denied blacks the right to vote, limited their freedom of movement, and criminalized behavior. White southerners overplayed their hand. The combination of the harsh Black Codes and the prevalence of Confederates in southern delegations to Congress in the fall of 1865 hastened the beginning of what became known as Congressional Reconstruction. Essentially, Congress, controlled by a Republican majority, used its legislative powers and control over the federal purse strings in an attempt to impose answers to the “Big Questions of Reconstruction” listed above. The session [of "the colored men's convention"] was held in the African Methodist church, a small edifice in a back street of the city. The delegates were about a hundred and twenty in number, but crowds of colored citizens were interested spectators through the four days, and the house was always filled full. . . . [T]hese men though ignorant were intelligent, and often spoke exceedingly well. "Yes," said one of the cleverest among them—"yes, we are ignorant. . . . They say we don't know what the word constitution means. But if we don't know enough to know what the Constitution is, we know enough to know what justice is." White northerners gradually understood that they would need allies in the South if the region was going to be reconstructed. The majority of white southerners had already demonstrated their reactionary preferences when they voted for former Confederates and supported the Black Codes. Consequently, by 1868 many white Republicans were open to the prospect of extending full citizenship to former slaves. Black southerners did everything within their power to speed the evolution of northern attitudes. Within months of the end of the Civil War former slaves in the South had gathered in conventions to proclaim their vision for their region and their race. Contrasting their devotion to the Union with the treason of their white neighbors, black southerners also stressed that the reconstruction of the former Confederacy could not proceed without their participation. And in the name of justice, the sacrifice of northerners, and the nation’s revolutionary heritage, blacks demanded that the nation acknowledge their rights as citizens. Most white northerners were reticent to embrace these demands in 1865. Within two years white southern intransigence, African American appeals, and political necessity convinced many northern Republicans that extending citizenship to former slaves was a prerequisite for the restoration of the Union. But how could the guarantees of citizenship be extended to blacks when states had traditionally been the guarantors of rights and the former states of the Confederacy were now controlled by white southerners who championed white supremacy? The resolution of this conundrum was the Military Reconstruction Act (1867). It divided the states of the South into military districts under federal military command. No southern state could return to civilian rule until its voters, including black men, framed a state constitution that guaranteed black suffrage. In addition, each southern state had to ratify the Fourteenth Amendment to the federal Constitution. The Fourteenth Amendment was multi-purpose constitutional device that was intended to resolve several of the questions hanging over the nation. It ended the president’s power of granting easy pardons to Confederate leaders. Most important, it established a constitutional guarantee of basic citizenship for all Americans, including African Americans. By defining as an American citizen anyone born in the United States or naturalized here, the amendment prohibited states from depriving any person, of “life, liberty, or property, without due process of law.” At the very least, the amendment established a national benchmark for citizenship. It is worth pausing for a moment and acknowledging just how extraordinary the developments in 1867—the Military Reconstruction Act and the Fourteenth Amendment—were. The United States made itself unique among modern slave societies when it gave the vote to former slaves almost immediately after emancipation. Whereas elsewhere—Jamaica, Haiti, Brazil, etc.—virtually no former slaves were enfranchised, in the United States former slaves and their former masters competed for political power two years after the abolition of slavery. The participants in Reconstruction fully understood that contests over political and civil rights could not be isolated from the economic reconstruction of the South and the nation. For blacks, the end of slavery of course did not mean the end of work, but rather an end to forced labor. Blacks relished the prospect of receiving the benefits of their own labor. But the vast majority of blacks emerged from slavery lacking the ability to buy land and confronted by a white community opposed to extending credit to blacks or to selling them property. At the same time, that whites looked for a system of labor and the Black Codes to bind blacks to the land, as slavery had, freed people coveted land of their own and struggled to be masters of their own time and labor. Former slave owners in the South were vigilant about protecting their interests. Before the Civil War labor was the key to wealth in the South; after the war land was the key. White landowners understood the power the new circumstances gave them, but they could not control the largest external forces that shaped the region’s economy. It was these powerful national and international forces that guaranteed the restored nation had a more unified economy than ever before. Railroads helped open the South's economy to national forces.Arguably railroads did as much as anything else to stitch the nation back together again. The late 1860s and 1870s were a period of breakneck railroad construction and consolidation. Although it is commonplace to dwell on the completion of a transcontinental rail line in 1869, the extensive reconstruction and expansion of southern railroads destroyed during the Civil War was of equal importance. Northern railroad companies and investors loomed large in these developments. Nothing more dramatically symbolized the emerging integrated national market than the massive regional effort on a single day in 1886 when all of the small gauge rail lines in the South were moved several inches wider and realigned with the rail lines of the North. 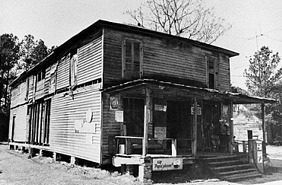 Country store, Jenkins County, Georgia. Another crucial economic development of the Reconstruction era was the transformation of the southern system of credit. Prior to the Civil War, the South’s system of credit had ultimately rested on cotton and with British traders. That is, southern planters borrowed against their projected earnings in cotton. This system of credit was shattered by the Civil War, and the South became a credit poor region for decades to come. White landowners had land but no cash to pay laborers; former slaves had labor but no cash or credit to buy land. As a result, a system of sharecropping emerged in the South that enabled landowners to secure labor and workers to secure access to land. Little if any cash was exchanged in the system of sharecropping; both the landowner and the laborer received cash only at the end of the growing season when harvested cotton was sold at the market. In this new economy, the most important source of credit was the local store where agricultural supplies and food were purchased. In other words, the local merchant, not some distant British cotton trader, was the immediate source of credit. And the local merchant’s source of credit was American banks, which, as a result of Republican policies, now had to meet national standards. In short, the South was effectively brought into a national system of credit and labor as a result of Reconstruction. “Free” labor, rather than some system of coerced labor would prevail in the region. Neither serfdom nor peasantry would replace slavery. And southern landowners and freedmen, whether they wanted to or not, were incorporated into the national credit markets. Let us now take stock of the answers to the questions that we began with. On what terms would the nation be reunited? In short, on national terms. Property was not expropriated or redistributed in the South. Reforms that were imposed on the South—the Fourteenth and Fifteenth Amendments, for example—applied to the entire nation. What implications did the Civil War have for citizenship? The Fourteenth and Fifteenth Amendments represented stunning expansions of the rights of citizenship to former slaves. Even during the depths of the Jim Crow era in the early twentieth century, white supremacists never succeeded in returning citizenship to its pre-Civil War boundaries. African Americans especially insisted that they may have been deprived of their rights after the Civil War but they had neither surrendered nor lost their claim to those rights. What would be the future of the restored nation’s economy? In simplest terms, Abraham Lincoln’s famous observation that a house divided cannot stand was translated into policy. However impoverished and credit starved, the former Confederacy was integrated back into the national economy, laying the foundation for the future emergence of the most dynamic industrial economy in the world. African Americans would not be enslaved or assigned to a separate economic status. But nor would African Americans as a group be provided with any resources with which to compete. Possible student perceptions of Reconstruction Aside from the challenge of organizing the complex events of the Reconstruction era into a narrative accessible to students, the biggest challenge is to help students understand what was possible and what was not possible after the Civil War. Students, for example, may be inclined to believe that white Americans were never committed to racial equality in the first place so Reconstruction was doomed to failure. Some students may fixate on northern white hypocrisy; many white Republicans pressured southern voters to pass the Fourteenth and Fifteenth Amendments even while they opposed its passage in the North. Yet others may emphasize that citizenship rights for blacks were hollow because blacks had no economic resources; blacks in postwar America could not easily escape an economic system that was slavery by another name. Each of these positions is worth discussion, but each tends to flatten out the motivations and behavior of the actors in the drama of Reconstruction. And virtually all of these interpretations presumed that the outcome of Reconstruction was both inevitable and wholly outside the hands of African Americans. Ask students to design their own version of Reconstruction. One approach that I have adopted in hopes of countering these tendencies is to ask students to state their “first principles” that they think Reconstruction should have pursued and established. If your students are like mine, many will propose that Reconstruction should have guaranteed equal rights for all Americans. I then ask them to define what those rights should have been. At this point, even students who are in broad agreement about the principle of equal rights for all Americans may differ on the specific content of those rights. For example, some may stress economic equality whereas others may emphasize equality of opportunity. In any case, the next step is to ask the students to think about how they would have turned their principle into policy. Those students who may have stressed economic equality may then sketch out a plan for “forty acres and mule” for each former slave. Those who stress the need for equal opportunity may sketch out the need for public education for freed people and other southerners. I next ask students where the requisite resources for these policies would come from. For example, where would the federal government have gotten the land and money to provide former slaves with land and livestock? If the federal government had expropriated land and resources from former slave masters, what consequences would that policy have had for private property elsewhere in the United States? (If the government could take lake and property from former slave masters, would it then have had precedent to later take land and property from former slaves?) What would the consequences of this policy have been for the production of cotton, the nation’s most important export? In response to students who propose universal public education, I ask them about the funding for these new schools. Who would pay for them? If taxes needed to be raised, what and whom should have been taxed? Should the schools have been integrated? If so, how would the resistance of white southerners to integrated schools be overcome? If not, would separate schools for blacks and white have legitimized segregation? Through this exercise, students gain a better sense of how all of the facets of Reconstruction were interrelated and how any broad principle was shaped by the circumstances, constraints, and traditions of the age. Equally important, students will better appreciate how astute African Americans were in pursuing their goals during the Reconstruction era. They recognized that the Civil War had ended slavery and destroyed the antebellum South, but it had not created a clean slate on which they had a free hand to write their future. Instead, black Americans were constantly gauging what was possible and who they might ally with to translate their long-suppressed hopes into a secure and rewarding future in American society. The role of African Americans in Reconstruction The search by African Americans for allies during Reconstruction is the focus of another worthwhile exercise. It is essential for students to understand that African Americans were active participants in Reconstruction. They were not the dupes of northern politicians. Nor were they cowed by southern whites. This said, African Americans never had decisive control over Reconstruction. Whatever their goals, they needed allies. With that fundamental reality in mind, Ask students to identify the major stakeholders in Reconstruction. I ask students to draw up a list of the groups in American society who had a major stake/role in Reconstruction. Typically, students will identify the major actors as white northerners, white southerners and blacks. I then press the students to break those groups down further. Were all white northerners alike in their attitudes toward blacks? Were all white southerners? And were there any sub-groups of African Americans that should be distinguished? After this revision, my students typically distinguish between pro- and anti-black white northerners, elite white southerners, middling white southerners, blacks who were free before the Civil War, and recently freed slaves. Once we have identified the actors in Reconstruction, we then systematically work thorough this list and consider what interests each of these groups might have shared. Put another way, on what grounds could each (any) of these groups found common cause with African Americans? Take middling whites for example. Many students may wonder why poor white southerners did not forge an alliance with former slaves. After all, they had poverty in common. Some students might suggest that poor whites refused to acknowledge their common condition with African Americans because of racism; a poor white man, in short, may have been poor but he could insist that at least he was a member of the “superior” white race. I also point out that poor whites and poor blacks may both have been poor, but they were poor in very different ways so that they were at best tentative allies. Poor whites typically were land poor; that is, they owned land but usually not the other resources that would have allowed them to exploit their land intensively. Black southerners were poor and landless; most had no significant holding of land to exploit. Consequently, when blacks called for expanded social services such as schools to meet their needs, they were implicitly calling for additional taxes to fund the services. What would be taxed to fund these new schools and services? In the nineteenth century, tangible property, and specifically land, was the principal taxed property. Taxes on the land of poor whites, then, helped to underwrite new schools in the Reconstruction South. These taxes, in the end, drove a wedge between poor whites and African Americans and ensured that black southerners could not take for granted the support of poor white southerners who bridled at paying taxes on their land to fund new schools. Or take the example of white northerners. Even some white Republicans who were unsettled by calls for racial equality could be allies of former slaves. Republicans believed that without the support of black voters in the South their party might surrender national power to the Democratic Party. Expediency alone, then, coaxed some white Republicans to support political rights for blacks. But as soon as the Republican Party garnered a sufficient national majority so that the support of southern blacks was no longer essential, these same northern Republicans urged the party to jettison its pledge to defend African American rights. This exercise helps students see African Americans as actors in Reconstruction, but actors constrained by the actions of other actors. This exercise turns Reconstruction into a dynamic process of contestation, negotiation, and compromise, which, of course, is precisely what Reconstruction was. What resources did the formerly enslaved bring to freedom? Finally, another possible approach is to focus students’ attention on the resources that African Americans could tap as they made the transition from slavery to freedom. I ask students to consider the needs that African Americans, as free Americans, had in 1865 and the resources they had at their disposal to allow them to survive as free Americans. This exercise prompts students to consider the resources and institutions that blacks already possessed in 1865 as well as those that blacks would subsequently need to build. In other words, many slaves possessed skills (some could read, some were skilled artisans) and had built institutions (particularly religious institutions) that were foundations for black communities after emancipation. Taking these into account, students can then consider what additional resources former slaves needed and how they might have acquired these resources. This approach to Reconstruction inevitably leads to discussion of the possibilities and limits of black self-help as well as the prospects for meaningful assistance to blacks from white Americans. It also often leads to valuable discussions of the merits and drawbacks of the racially exclusive institutions that emerged during Reconstruction, such as schools and churches. Students gain a better appreciation, for example, of why blacks preferred schools taught by black teachers and black denominations even while students also recognize the subsequent vulnerability of these institutions. No era of American history has produced hotter scholarly debates than Reconstruction. Historians may have written more about the Civil War but they have argued louder and longer about Reconstruction. With a few notable exceptions, however, most of the scholarship on Reconstruction from the late nineteenth century to the 1960s ignored or denied the prominent role of African Americans in the era’s events. Blacks were rendered as the pawns and playthings of whites, whether they be white northerners or southerners. The most notable exception to this willful silence about blacks and Reconstruction was W. E. B. Du Bois’s Black Reconstruction (1935). Du Bois dissented from the then current interpretation of Reconstruction as a failed experiment in social engineering by placing the former slaves and the battle over the control of their labor at the center of his story. For him, Reconstruction was a failure not because blacks were unworthy of it but because white southerners and their northern allies sabotaged it. Not until the 1960s did a new generation of professional historians begin to reach similar conclusions. Spurred on by the civil rights struggle, which was commonly referred to as the “Second Reconstruction,” historians systematically studied all phases of Reconstruction. In the process, they fundamentally revised the portrait of African Americans. John Hope Franklin, in Reconstruction, Kenneth Stampp, in Era of Reconstruction, and others recast African Americans and their Republican allies as principled and progressive minded. By the 1970s, a subsequent wave of scholarship began to revise the largely positive take on the Reconstruction offered by Franklin, Stampp, et. al. Now Reconstruction was seen as an era marked by muddled policies, inadequate resources, and faltering commitment. William Gillette’s Retreat from Reconstruction (1979) was the fullest expression of this interpretation. Eric Foner’s Reconstruction synthesized the previous quarter century of scholarship on the period and offered the richest account yet of the role of African Americans in shaping Reconstruction. Foner also placed the accomplishments of Reconstruction in a comparative framework and concluded that the rights that the former slaves acquired during the era were exceptional when compared to those in any other post-emancipation society in the western hemisphere. Reconstruction may have left the former slaves with “nothing but freedom” but that freedom, Foner stressed, was written into the Constitution and was never completely compromised. Since the publication of Foner’s work, most scholarship on Reconstruction has been devoted to topics that had previously been ignored by scholars. For example, the roles of black women, the struggle to develop a system of labor to replace slavery, and the emergence of black institutions have all been the focus of recent scholarly monographs. Two recent works that build on these works and suggest new directions for scholarship on Reconstruction are Heather Cox Richardson’s West From Appomattox: The Reconstruction of America after the Civil War (2007) and Steve Hahn’s A Nation Under Our Feet: Black Political Struggles in the Rural South, From Slavery to the Great Migration. Richardson highlights the importance of the Trans-Mississippi West in the political machinations and economic visions of the architects of Reconstruction while Hahn highlights the shared ideological values and cultural resources that sustained southern blacks in their struggle for economic and political power in the postbellum South. W. Fitzhugh Brundage was a Fellow at the National Humanities Center in 1995-96. He is the William B. Umstead Professor of History at the University of North Carolina at Chapel Hill. Brundage, W. Fitzhugh. “Reconstruction and the Formerly Enslaved.” Freedom’s Story, TeacherServe©. National Humanities Center. DATE YOU ACCESSED ESSAY.